7-8 July 2012 - Columbus, IN - On a sun-drenched and oppressively hot mid-summer weekend, long-time course owners Carl and Karen Miller for the second-consecutive season very warmly welcomed the PPA National Tour to their beautifully-maintained Putt-Putt Fun Center in the bucolic setting of Columbus, IN for the contesting of the tour's third event of the season, the two-day PPA Northern Open, conducted jointly by the PPA Indiana and Great Lakes Tours. In the months preceding the event, globetrotting local stars Nate Nichols, a highly-respected Columbus area educator, and 2008 PPA National Champion Kevin Lacey spent countless hours preparing the course # 1 layout for the abbreviated 108-hole competition, working tirelessly to adjust and perfect the course's hole designs, rails, carpets, and tee mats. As a result of their diligent efforts and despite the fluffing of the course's relatively new carpet fibers due to the record-setting temperatures, a highly-competitive weekend with low field scoring ensued. In a tournament that featured numerous lead changes, two past PPA Northern Open champions, 2007 winner Rick Culverhouse and 2009 and 2010 champion Jay Klapper, emerged atop the final leaderboard with a six-round total of 142. Culverhouse defeated Klapper in a hard-fought 18-hole playoff to capture the second PPA Northern Open title of his illustrious career. "The amount of support that I received during the tournament was overwhelming," commented the 57-year-old Honda Express advisor from Chapin, SC. "I truly appreciated all of the positive thoughts. This by far will go down as my best and most satisfying victory." Play commenced in the professional division with Lacey storming into the lead with an opening-round 22. 1997 PPA National Champion Randy Reeves and local player Rick Ossenfort shared second place at 23. At 24, Nichols stood alone in fourth position. A large gaggle of players bunched in fifth place at 25 included Klapper, 2007 PPA National Champion Rick Baird, Mark Hasty, 1997 Indiana State Champion Jeff Garrison, PPA Hall of Fame legend Daryl Freeman, and 2010 Great Lakes Tour Champion James Weber. Lacey continued his solid start to the event in the second round, firing 24 to remain atop the 36-hole standings at 46. Reeves remained in second position at 47. Culverhouse entered the fray with a second-round 22 to move into a third-place tie at 48 with Baird and 2010 PPA National Champion Greg Newport, who also posted a second-round 22. With a third-round 23, Culverhouse leapfrogged over Lacey into the lead at 71 at the tournament's halfway mark. Lacey shot 26 to lurk in second place at 72. At 73, Nichols and Newport entered the final day of competition tied for third. A fifth-place logjam at 74 included Reeves, defending champion Andy Coradini, Baird, and 2006 PPA National Champion Brad Lebo. As the second day of action began, Lacey used a brilliant fourth-round 21 to charge back into first place after 72 holes at 93. Culverhouse opened strongly as well, carding 23 to hold on to second position at 94. With matching fourth-round 22's, Nichols and Newport shared third place at 95. Klapper, Reeves, and Lebo were grouped in a fifth-place tie at 98. The fifth round of play produced yet another shuffle atop the leaderboard. With Lacey struggling to a penultimate-round 28, Culverhouse and Nichols, who fired respective rounds of 24 and 23, pole-vaulted into a tie for the 90-hole lead at 118. Klapper continued his second-day assault on the course, shooting 21 to maneuver into third place at 119. Lacey tumbled into fourth position at 121. Reeves and Newport remained in contention, tied for fifth place at 122. In the closing round, Klapper completed a spectacular final-day 108-hole total of 67 by posting a final-round 23 to finish tied atop the final leaderboard at 142 with Culverhouse, who manufactured a solid sixth-round 24. A tournament champion would be determined by an 18-hole playoff. Lacey courageously rebounded from his fifth-round tribulations with a final-round 23 to complete the event in third place at 144. Nichols suffered a closing-round 27 to fall into a tie for fourth position with Reeves at 145. 2000 Great Lakes Tour Champion Rick Alessi provided final-round fireworks by carding a dazzling sixth-round course-record 19 to earn low-round honors for the event. The final of the 21 money spots awarded in the professional division in the event fell at a 108-hole score of 155. Culverhouse, Klapper, Reeves, Coradini, and Baird accepted the five spots offered to the top five finishers in the 2012 PPA Northern Open who did not already earn such a spot in the 2012 PPA Western or Southern Opens for a free entry fee into the professional division of the 2012 Tournament Players Championship to be held during the PPA National Championship week. In the ensuing 18-hole playoff, Culverhouse and Klapper started with a flourish, as the duo matched aces on each of the playoff's first four holes. Klapper took a one-stroke advantage with an ace on the 6th hole. After Klapper was forced to convert a challenging deuce putt on hole 7, Culverhouse answered with an ace to square the match. Culverhouse made a difficult deuce putt of his own on the 8th hole, banking in a stymied deuce putt off of the left rail on the classic three-brick hole. Klapper followed with an ace to regain a one-shot advantage. But with Culverhouse's unanswered birdie on the ninth hole, the contestants completed the outward nine deadlocked at six-under par. Culverhouse opened up a two-stroke lead by acing the 10th and 11th holes. Klapper closed the gap to one stroke with a birdie on the fickle 12th hole. With an ace at 13, Culverhouse once again moved two strokes ahead of Klapper. Culverhouse subsequently missed the anthill 14th hole but made his testy deuce putt for par. Klapper followed with a hole-in-one to again cut the deficit to a single shot. Culverhouse aced the 15th hole to regain a two-stroke lead. Both players birdied the nearly-automatic ring-hole 16th. Culverhouse left his ace effort on the three-tiered 17th hole sitting on the left lip of the cup with part of the ball hanging over the cup. Klapper suffered a similar fate, as his tee shot lipped the hole and sat on the right edge of the cup. With honors, Culverhouse prudently layed up the final hole for a tap-in deuce. In the process, Culverhouse earned his second-career PPA Northern Open title and the $650.00 winner's check by a final playoff tally of 25-27. 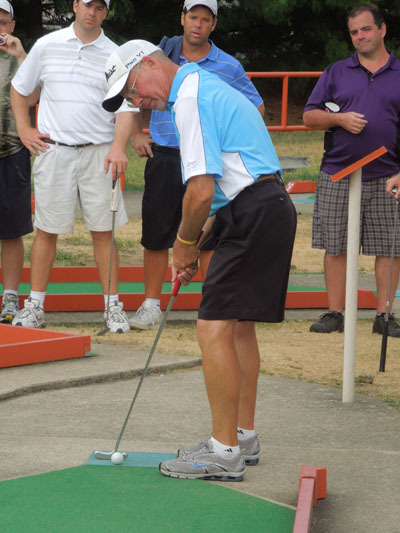 In the amateur division, 2011 ProPutters.com Classic APA Champion Danny Tatum, 49, may have drawn inspiration from the recent PGA Tour major victories recorded by players using long anchored putters. The broomstick putter-wielding General Manager of Beauregard Country Club from DeRidder, LA pendulum-stroked his way to an impressive wire-to-wire one-stroke triumph with rounds of 22, 26, 22, 24, 25, and 29 for a 108-hole total of 148. 2003 APA National Champion Bonnie White gave spirited chase, but settled for runner-up honors at 149. Donnie L. Carpenter, a grizzled APA veteran who won numerous National Tour major APA titles in the 1990's and who recently returned to the sport after a lengthy hiatus, brought the gallery to its feet with a sizzling final-round 21, the low round of the tournament in the amateur division. In the process, Carpenter climbed into a third-place tie at 152 with 2010 Great Lakes Tour APA Champion John Kropinak. Defending champion Travis Robinson completed the event in fifth position at 156. The last of the thirteen amateur division expense reimbursement spots allocated in the tournament came at a six-round score of 172. The PPA National Tour extends thanks and expresses its gratitude to Columbus, IN course owners Carl and Karen Miller for their hospitality in hosting a very succesful weekend of tournament action. The Millers once again truly rolled out the figurative red carpet for the tournament players throughout the week. The tour looks forward to returning to the Columbus, IN facility for the 2012 PPA National Championship week from September 11-15. 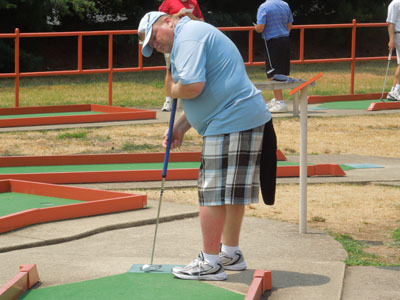 The next stop on the PPA National Tour will be the Richmond, VA Putt-Putt Fun Center, which will host the two-day, 108-hole PPA Eastern Open on the weekend of August 11-12, 2012 on course # 2. The first three rounds of play will commence at 11 a.m. on Saturday, August 11, with tee off for the event's final three rounds slated for 9:00 a.m. on Sunday, August 12.